From nationally known television news personality and attorney Kimberly Guilfoyle to countless other women of the NRA—and even NRA Executive Vice President and Chief Executive Officer Wayne LaPierre himself—great minds were thinking alike at the NRA Women’s Leadership Forum (WLF)-sponsored luncheon to open the 2019 Dallas Safari Club Convention here at Dallas’ Kay Bailey Hutchinson Center, Jan. 17-20. Guilfoyle, who co-hosted The Five on Fox News until she left last July to join America First Policies, a pro-Trump super PAC, was front and center campaigning for conservatives in the 2018 midterm elections. Prior to entering television, she was a prosecuting attorney in San Francisco and Los Angeles, serving as assistant district attorney in San Francisco from 2000-2004. She saw firsthand how we need to focus on the individual and uphold the gun laws that are already on the books. 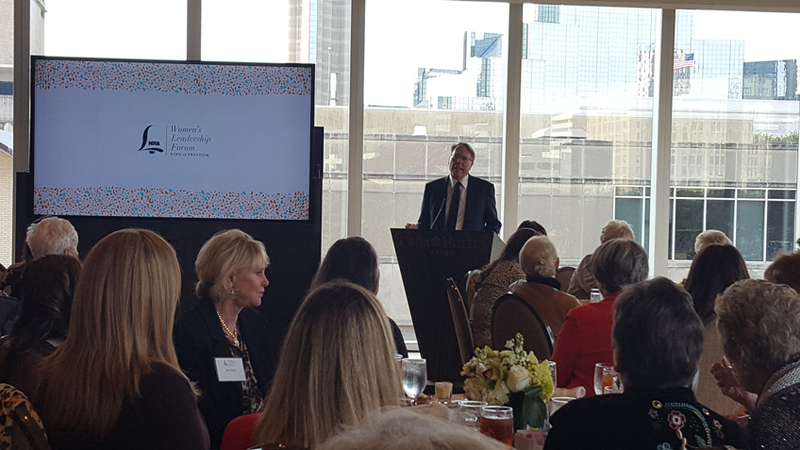 NRA Executive Vice President and Chief Executive Officer Wayne LaPierre speaks at an NRA Women's Leadership Forum luncheon, rallying the troops and kicking off the 2019 Dallas Safari Club Convention. Typically Guilfoyle would be a tough act to follow, but then it was Wayne LaPierre’s turn to speak—a man who spends every minute of every day fighting for our freedom and our children’s freedom. “You are the cutting edge of saving the Second Amendment in this country,” LaPierre said, proudly adding that the latest survey he’d seen showed that the NRA was voted the most patriotic organization in the country”—as if this crowd had any doubt. LaPierre highlighted the “mega smear” across America as anti-gun, anti-hunting extremists try and shut down the NRA. “It doesn’t matter what the truth is. It just matters what you can make people believe,” he said, citing how our country could cut the murder rate in half just by prosecuting and enforcing laws. After sharing the success the NRA has had in recent elections, spending $75 to $80 million in 2016 alone, he explained that anti-gun, anti-hunting extremists like Michael Bloomberg knew they had to go after the NRA. For those who are unaware, the NRA is incorporated in the state of New York, so in March 2018, Governor Mario Cuomo ordered his state’s Department of Financial Services to go after every New York bank and insurance company that did business with the NRA. The threat: Those that did not cease doing business with the NRA would cease to do business in New York. As the NRA’s banking and insurance relationships crashed, the NRA filed and fought a $35 million lawsuit—and won. Cuomo did not get away with weaponizing government… this time. So while the NRA spent the last year rebuilding, the good news is that it closed out 2018 with the highest NRA membership in history. “But they don’t want the NRA,” LaPierre warned. “They want the guns in your gun safe, your carry permit, your hunting land,” he said. “We need to tell the 100 million gun owners in this country that while they are putting red paint on NRA-ILA Executive Director Chris Cox’s home today, it will be on yours tomorrow in an attempt to shame you into giving up this freedom.” Hitting home the point, he referenced the absence of such freedom in countries such as Cuba, Venezuala and China, which use the full strength of their governments to crush their citizens. So as the NRA fights for 100 million gun owners—and for everything that is American—LaPierre shared a powerful parting shot using the words of 19th century frontiersman, soldier and politician Davy Crockett, who had had enough when he said, “You can all go to hell. I’m going to Texas.” Applause erupted from this Dallas crowd. “We need every American city to say to Cuomo, ‘You can go to hell. I’m joining the NRA to fight for freedom.” Powerful words from a powerful man made to the most powerful crowd in America: freedom-loving patriots.